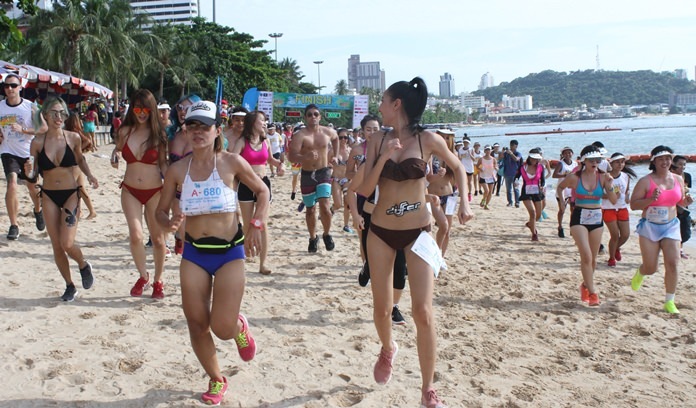 There were plenty of bare mid-drifts, but the focus was on the feet at the first Pattaya Bikini Run. Pattaya City Council Chairman Anan Angkanawisan kicked off the Aug. 6 race at Central Festival Pattaya Beach with city leaders and tourism officials and Jiranat Suwanchuen of sponsor Singha Thailand. 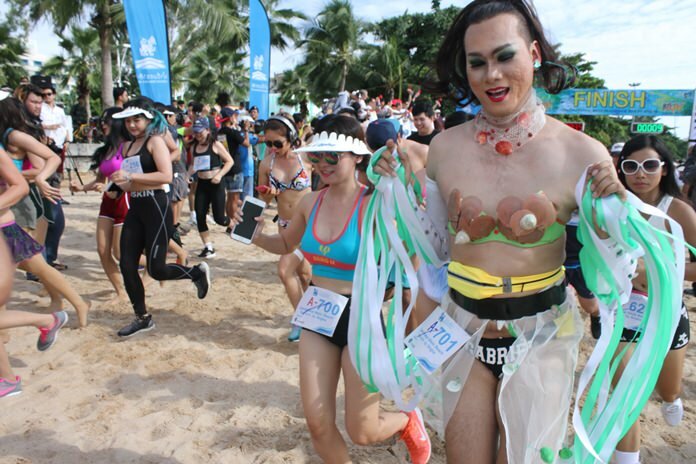 Scantily clad competitors race from the start line on Pattaya Beach during the inaugural Bikini Run on August 6. The race was intended to drive tourism by putting lots of skin on display while promoting exercise as well. 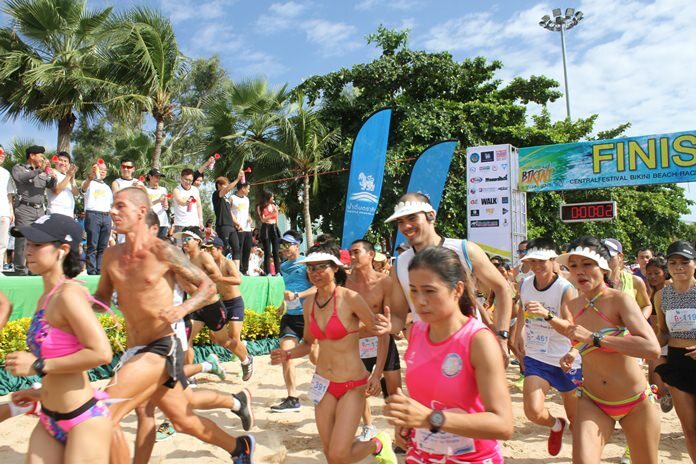 Three- and nine-kilometer races were held, both taking routes through Beach and Second Roads between the mall and the Amari Orchid Resort & Tower. Participants donned swimwear of all styles and colours. Those watching were also entertained by musical performances from bands including Playground, plus the crowd was invited to join in warm-up and stretching exercises. Men’s (16-39) 9km – Sutat Kalayakithi, Thanakorn Ket­prayul, Tachapol Sirikanya. Women’s (16-39) 9km – Karath Khamsrong, Somkit panaengpetch, Pattama Nakprieng. Men’s (Open) 9km – Saman Kaewkiew, Rossone Osvaldo, Sombat Worath. Women’s (Open) 9km – Pikul Thonglue, Nathiya Sangketkij, Pranee Pansatin. 3km Fun Run (Open) – Piya Boonriew, Ciisa Maija, Maria Weckman. First-place winners took home 800 baht, a bikini set from Tojina and a skin-care kit from Sira Spa. Second-place winners took home 500 baht and the same prizes. Third place was good for 200 baht and a bikini. Music to race to helps this young athlete to the finish line.